Last weekend the clocks leapt back, leaving summertime behind for another year and this morning the calendar seems to have leapt forward, to November - already. Does anybody else feel like this year is slipping away too fast? More importantly does anyone have any idea how to slow it down? Here in France we are on holiday, a double holiday in fact for those of us with children. 1st November is Toussaint, or All Saints' Day and a public holiday, that always falls during the mid term school holidays. It is a beautiful time of year, the autumn colours in the hedgerows are glowing and the florists and cemeteries are ablaze with colourful chrysanthemums, left at graves by families as a mark of respect and remembrance to their loved ones for All Souls' Day (2nd November). 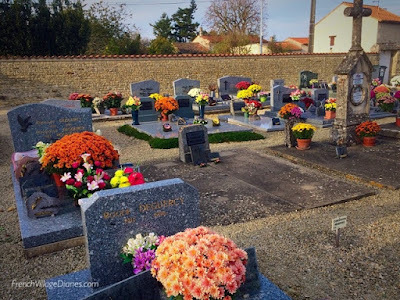 It is worth noting that despite their beautiful array of colours the French only buy chrysanthemums for the cemeteries and never as gifts for friends or autumnal decorations for their house and garden. Ed has been on holiday all of last week and this week too and in that time I’ve driven over 700km. I’d love to tell you about our adventures; Paris maybe (400km from here) or Lyon (500km away and somewhere I’ve always wanted to visit), but no, sadly we have been nowhere. This is just the general running around involved in living in a small village (in the middle of nowhere) with a teenager whose friends and social life is no longer on the doorstep. The funny thing is that I don’t even like driving that much and would certainly think twice before getting in the car and driving myself to Lyon or Paris, but having calculated my mileage this past week, maybe I should be packing my bags and planning a real getaway. At least I’ve managed to spend some fun time with Ed (fitting me in around his socialising) over the holidays, and it’s mainly been in the kitchen. He has been away from home, boarding at lycée from Monday to Friday, since he was 15 years old. This is something else that seems to have sped past very quickly, and means time at home, learning to cook, clean and run a house, has been rather limited. 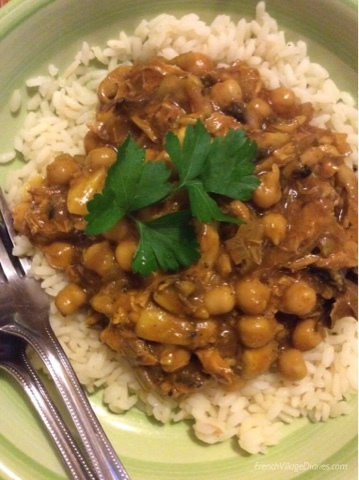 This week I’ve actively encouraged him make a mess in my kitchen, learn how to experiment with flavours and create simple but tasty meals, as well as clearing up afterwards. He has learned a lot and I’ve learned that I’m a bit of a control freak when it comes to someone else cooking in my kitchen, but we’ve both enjoyed his efforts and spending time together. What's for dinner tonight Ed?